*Core housing need means that the householders spent 30% or more of their before tax income on housing; the housing was in major need of repair; or their housing was crowded – it did not have enough bedrooms for the size and make-up of the family. Source: CICH graphic created using data adapted from Canadian Mortgage and Housing Corporation (CMHC). Canadian Housing Observer. 2014. https://www.cmhc-schl.gc.ca/en/hoficlincl/observer/upload/newcomers_housing_68203_w.pdf – accessed March 19, 2018. 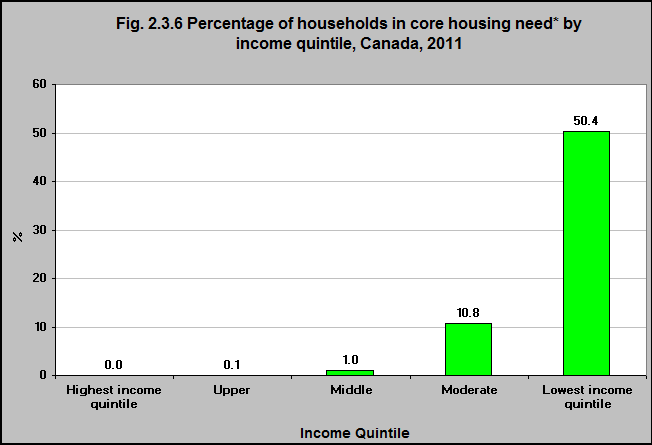 In 2011, 50% of households in the lowest income quintile were living in core housing need. None of the households in the highest income quintile were in core housing need – only 0.1% in the upper quintile and 1.0% in the middle quintile.